Hi! My name is Christi Deason & I have a couple questions, but they are not related to this post. First of all, I can’t figure out how to just leave a general question/comment on your blog. So, I tried to send you a message on the Facebook messenger & I never got a response. So, anyways, I’ve been waiting for a general question/comment to come through my email for I get them when they are posted on your blog. But, that hasn’t happened in awhile, so I decided to just question/comment here. So, I have 2 questions. One is are there only two guitars available to practice on? Wondering because I have a social task to practice guitar & I have tried to do so with two different ones & it won’t let me. I wanted to make sure there were only two different kinds before I try to figure out why I can’t do so….. The other question is, am I right you are still having problems with your party boat & excepting friend requests? I couldn’t remember & I used to have you on it awhile ago. Since then I’ve had to start over because an update messed me up & since then I haven’t had you but the other friends I had on the party boat stayed. So, I just wanted to check to make sure it wasn’t just me thinking “Why don’t I have you on my party boat, but have all my other friends I had before I had to start all over?” Thanks again for all your advice!! I love your page on Word Press all about The Sims Free Freeplay! I go to it often whenever I need advice on the game & it is very helpful! Firstly I’m sorry but facebook have suspended my account so I am unable to reply to anyone who messages me on there anymore. I have tried contacting them several times to fix this issue but they just won’t answer me! Well as I said I can’t access my facebook so everyone who I was neighbours with before will no longer see me as I won’t be friends with them on facebook anymore, sorry again! You’re welcome and I’m glad it helps! Thanks for the info & once again for having this blog! That is really weird about Facebook, though. I wish that could get fixed. Has to be frustrating for you for I’m pretty sure you have many followers! Anyways, thanks again! Is there anyway to give existing Sims personalities & life dreams? Also it seems some younger sims are aging quicker than ones I made prior to them. I’m experimenting to see if anything effects the aging like more work, not keeping them happy etc. Have you noticed anything like this? You’re welcome and thanks 🙂 glad I could help! Do you know when the campground limited time quest is going to start? It started at midnight here. I’ve been saving LP’s because I REALLY wanted the outdoor lights. They knocked down the time to complete the task to 1 1/2 hours. I used 86 LP’s because as soon as he started the task I kept restarting him using an LP, only had 2 repeats and finished in 1 1/2 hours. I like REALLY don’t want two of my sims to become elders and I don’t have to worry about this quest for a while, but how can I earn orbs fasted than those two sims can age? And do they start aging as soon as the quest starts or when it’s over? It takes a long time as you need to get a bronze to a silver to a gold to a platinum which will cost you 4 sims, the time varies depending what life dream you pick though. When I get new sims as of now there isn’t a place to get the personalitys. It used to like 3 years ago when I started playing. All I see in the create a sim mode is color name gender and then the clothes face etc. What if I don’t give them personality or life dream can I pause them ???? Can you pass on the orb to any Sim of any age? 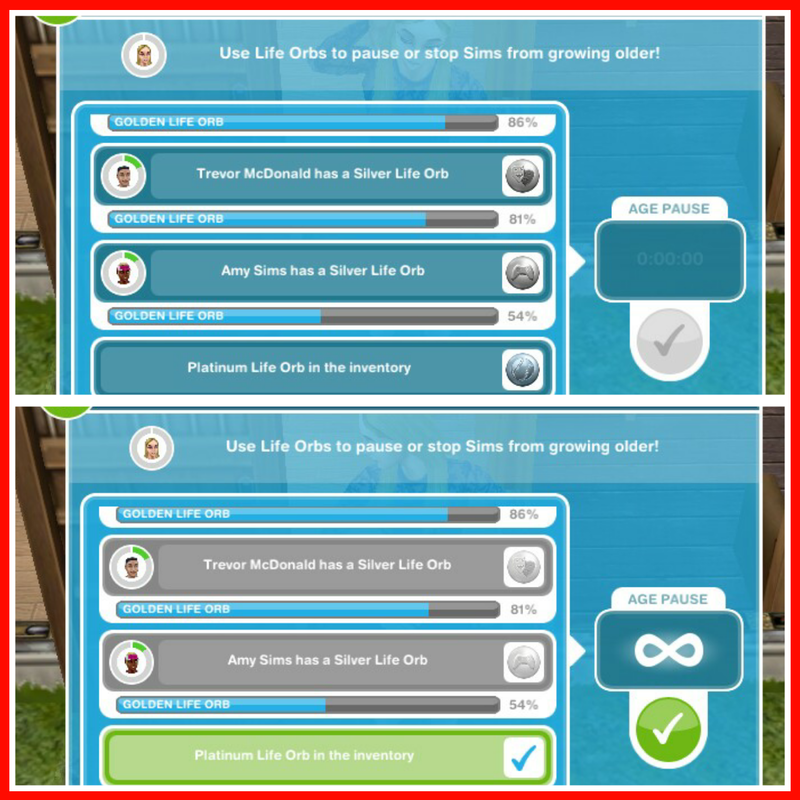 I also want the Sim I based on myself to live forever so I thought I might have a Sim around the same age quickly get up to silver and then pass that on to a younger Sim to make a gold and then another Sim to make the platinum. I’m prepared to use LPs to extend my Self-Sim’s life for now but I just wanted to know if I will eventually be able to do it. Thanks in advance for your help and your blog. It has been invaluable to me as I play through the game! I gave a platinum orb to pause a sim and now that sim has a bronze orb and I have to select s life dream for them. Did I do something wrong? Also- should I give my favorite sims a platinum orb when I create them or when I choose to pause them? That may be what I did wrong. I find the entertainment life orb is the fastest orb to get including the most lucrative using the musician career and the gardening senior life dream to get orb completed fast. What is the time to grow old? When they are born sims, how long they live before they die? I was wondering once you finish this quest how long does one sim life typically last if you don’t use orbs and just let their life run its course. Like a couple weeks? 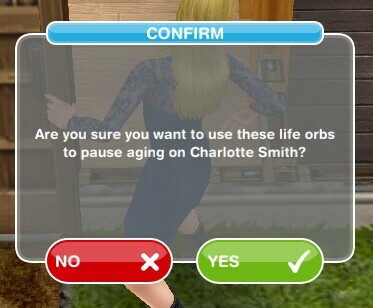 I don’t plan on using orbs cause I don’t have a favorite sim lol, I’m just curious if you know the lifespan by any chance. Hi. I’ve finished Life dreams and Legacies. And now I am sort of regretful, I want to control their ageing process. Do you think it is worth it if I reset the game? I am now on level 31. A part of me says that I should not as I will lose everything that I bought, but then If I would continue with the game, I can’t really get my sims to do anything as they will age faster if they keep on doing stuff. Oh, I don’t know what to do. Hii, I don’t have personalities option in my wardrobe when i choose browse clothes… is it because i didn’t finish life, dream and legacies quest or what? yes you need to complete the life dreams quest before you can give your sims a personality. When you use an orb to pause their aging is it like payment? Do you loose that orb? Or can you keep using it so on and so forth? Yes its like payment, you can only use the orb once. how long normal sim lives? If I’ve completed this quest and would prefer to not let my sims age, can I choose to not give them a personality/life dream? So I’ve just read on how to pause a sims life and I have a question. Once you’ve paused their life, does the orb you use become useless, making you have to start again? Like say I used a silver orb to pause a sim, does that make it useless and I’ll have to start by making it bronze again? Also, you’re really helpful, thank you for this blog! Does your new sims move into the existing houses after the other ones die or do you have to buy them all again. I just discovered FreePlay six months ago, and have been spending a huge amount of time and effort trying to get caught up. I read this post before I completed the Quilting hobby. 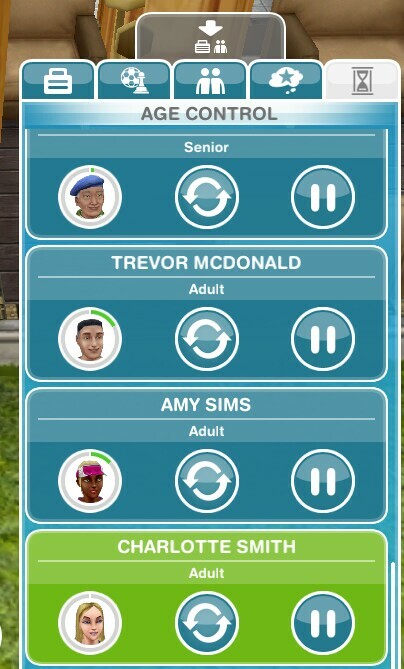 I have 28 Sims, and each one is “special”…each one has a family, back story, etc. I don’t want *any* of them to die, nor do I want my kids to age, until *I* am ready. I can create a Sim just for the purpose of dying, but my issue is this: if I complete Quilting, and all my adult Sims will become seniors within 24 days, I don’t have time to create 20 to 25 platinum orbs, right? But if I don’t complete Life Dreams, I can never build the Pet Park, etc. Is that correct? (I am exhausted trying to play through four years of game in a few months, and being faced with grinding through all of this to get the Pet Park, I am ready to give up on the game instead.) 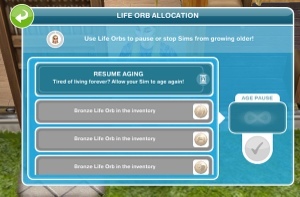 Also, if you stop a child Sim from aging “permanently” with a platinum orb, does that mean you cannot age them with a Birthday Cake either? As you have completed in stitches there isn’t really much you can do unfortunately apart from watch your sims age and die as they start to age as soon as you start the quest, there are things you can do to slow this down though and they don’t age in 24 days, they need to complete 24 days worth of actions so if you left them not doing any action at all then they won’t age. Hi, again, Magic. I’m sorry my post was unclear…I have NOT completed Quilting. I am not going to. To continue: *IF* I completed Quilting, all my adult Sims would become seniors within 24 days, and I don’t have time to create 20 to 25 platinum orbs, is that right? But if I don’t complete Life Dreams, I can never build the Pet Park, etc. Is that correct? Plus: is there any advantage to having at least one Sim maxed out for each Hobby? Or does all advantage “go away” once you have maxed out the Hobby itself, once? If you complete the quilting quest you your sims will age and die yes. But they don’t age in 24 days, they need to complete 24 days worth of actions so if you left them not doing any action at all then they won’t age. You won’t have time to get that many platinum orbs before all your sims die but you won’t be able to get any without sacrificing sims as it takes 4 sims to get a platinum. I recommend you have a few sims you don’t mind sacrificing (you can make them again later) and add a few new sims if you have space to earn the orbs you need to pause your favourite sims. You cannot build the pet park, carnival, arcade or beach if you do not complete this quest. And for the hobby question you already posted on my Hobbies: FAQs post so please read that reply. I have a problem. I finally earned 2 platinum orbs for my favorite Sims couple. I gave them the orbs the way you would normally do it instead of through the pause tab. They are still aging. How can I fix this so they can use the orbs to remain young and alive? I’m afraid I’ll lose the orbs after all the time I put into getting them. First, thank you for your help regarding my last Sims dilemma. Everything worked out after all, thanks to you! I have a question as to whether the Sims (either teens or adults) will be able to play the instruments (used for the teen idol) at the same time, together, at any point in time. Only one sim can be the teen idol to complete the hobby and adults cannot play those instruments to complete the hobby. Can I stop a Sim from aging at any stage of their life (if I want a Sim to stay a toddler forever) ? And if so, will I be able to age them later on without unpausing?